Vanilla beans are a gourmet staple. If you're curious about vanilla beans, there's a lot you can learn! Vanilla actually comes from a type of tropical orchid called Vanilla Planifolia, which grows in areas such as Madagascar, Uganda, Indonesia, Tahiti and Mexico. This particular orchid is the only kind that bears edible fruit. The pods are originally a greenish yellow, but turn dark brown once they are cured. 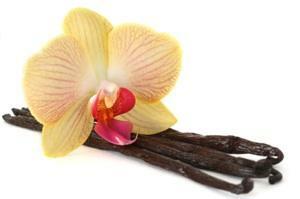 The first people to harvest and use vanilla were the Totonacs, who inhabited the coast of Mexico along the Gulf. The Aztecs eventually conquered the Totonacs, who began cultivating the plant as well and called it tlilxochitl, or "black flower". When the Spanish colonized Mexico, they also saw the value of vanilla and incorporated it into their own cooking. Vanilla beans like to be kept in an airtight container in a cool dark place. It's recommended that you don't refrigerate or freeze your beans, as they will harden and form crystals - they'll still be usable, but won't be in prime condition. If you live in a warm, humid area, make sure your beans are kept cool or they will mildew! If you're interested in making your own vanilla extract, it's easier than you think. You'll save yourself money, too, since vanilla extract is very expensive! Place split vanilla beans in glass jar, then fill with vodka or bourbon, making sure beans are completely covered. Store in a cool, dark place for two months, shaking the bottle every few days. After product is as strong as you like, you can rebottle it in decorative bottles and give as gifts. Many people are only familiar with vanilla in one form: bottled extract. You probably know that the extract comes from vanilla beans, but are you aware that the beans are a magical ingredient in and of themselves? There are so many things you can do with them, including making some really interesting gifts. If you'd like to make some vanilla sugar, it's an easy project that makes a wonderful gift for the foodies in your life. Just add it to your regular baking recipes for a comforting touch of vanilla goodness! Pour sugar into the glass jar, and push split vanilla pods into the sugar so that they're as submerged as possible. Seal jar and store in a cool, dark place, shaking every few days to agitate the sugar. After about a month, you'll have some lovely vanilla-scented sugar. Remove the bean, or feel free to leave it if you prefer a stronger-scented product. If you'd like to give vanilla sugar as a gift, consider getting small decorative jars to fill, tying them with a pretty ribbon. Be sure to pack a little piece of vanilla bean in the jar to keep the flavor fresh. Does the idea of vanilla salt sound weird to you? It actually makes a fantastic gourmet seasoning for all sorts of dishes. Think, caramel pralines, French salted caramels, or fudgy brownies. All of these treats will go well with a touch of salt, especially if it's infused with vanilla. To make vanilla salt, follow the directions above for vanilla sugar, only replacing the sugar with one pound of salt. Voila! Another great gift idea.